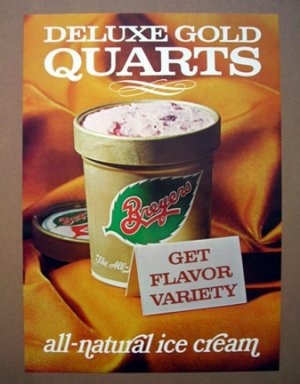 Breyers was once a well-regarded brand of ice cream, made with just a few natural ingredients. But recent cost-cutting measures have resulted in more and more artificial ingredients, not only changing the flavor and texture significantly, but also reducing the percentage of milk and cream so much that it can't even legally be called "ice cream" anymore; now it's "frozen dairy dessert". Sadly, what used to be a premium ice cream brand is now garbage. These days when I want to indulge an ice-cream craving my go-to choice is Häagen-Dazs vanilla. It is the only brand around whose ingredients list reads like Breyers vanilla used to.